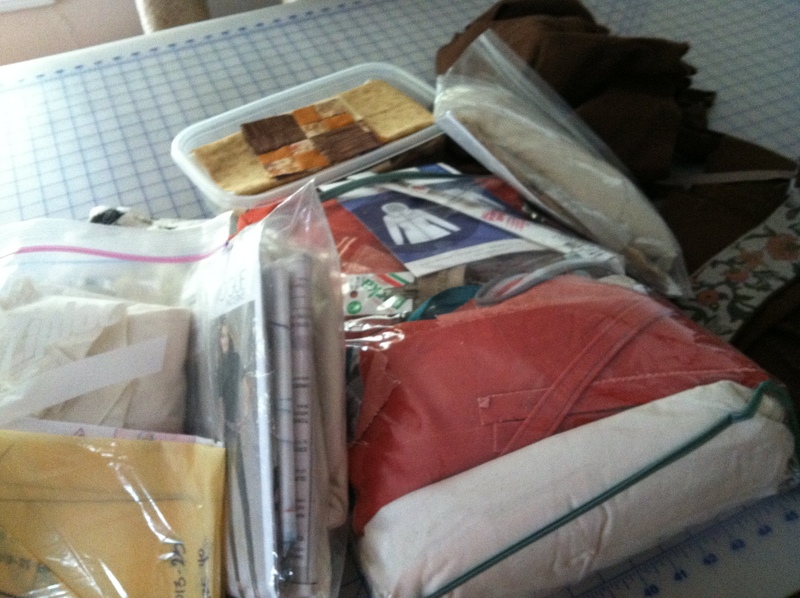 I don’t really keep my unfinished projects in grocery sacks at least not any more, instead I keep them in an odd assortment of containers strewn throughout my sewing room. I am not sure why I like to start projects and than not finish them – but I do. If ‘not- finishing-a-project’ was an Olympic Event, I would have a gold medal! My first ‘PIG’ is this Minuro Jacket. 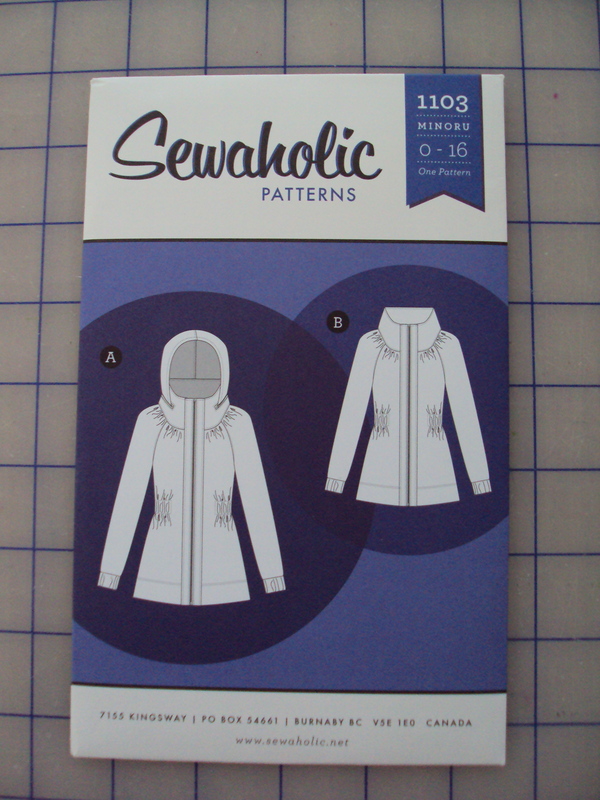 I had set this aside since I wanted to use a parka zipper rather than a regular zipper in the front. The local JoAnn’s doesn’t carry parka zippers and I couldn’t justify driving downtown to the Fashion District for a just a zipper. Could I? So I ended up ordering the parka zipper from the JoAnn’s website. I had thought of special ordering a zipper to coordinate with the orange denim, however, the specialty zipper websites I looked at were difficult to navigate so I gave up on that idea. So now, what is my excuse for not finishing it since I have the zipper? Well, maybe it is because I have started this project. I had gone to JoAnn’s Store to buy muslin. I always need muslin! While I was there I strolled over to the pattern cabinets and saw that Vogue patterns were on sale for $3.99. Who can pass up a $3.99 pattern? I surely can’t. 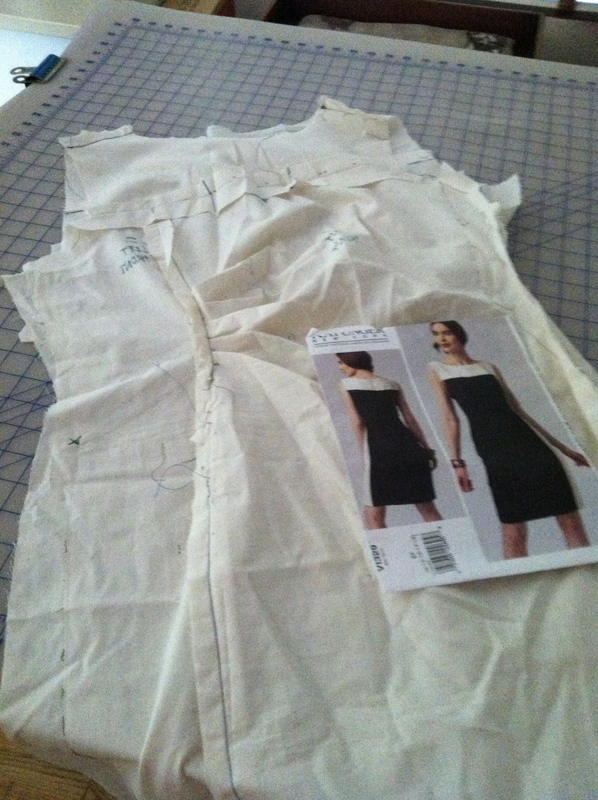 So far for this jean pattern I have sewn multiple muslins – I lost count! I sewed one pair of these jeans in the fashion fabric (which were a total wadder) and now I am on my second pair of jeans. I feel that I finally got a better fit, but the legs are a little snug so I need to let them out a bit and then finish the hems, the belt loops and the waistband, but instead I started this project. 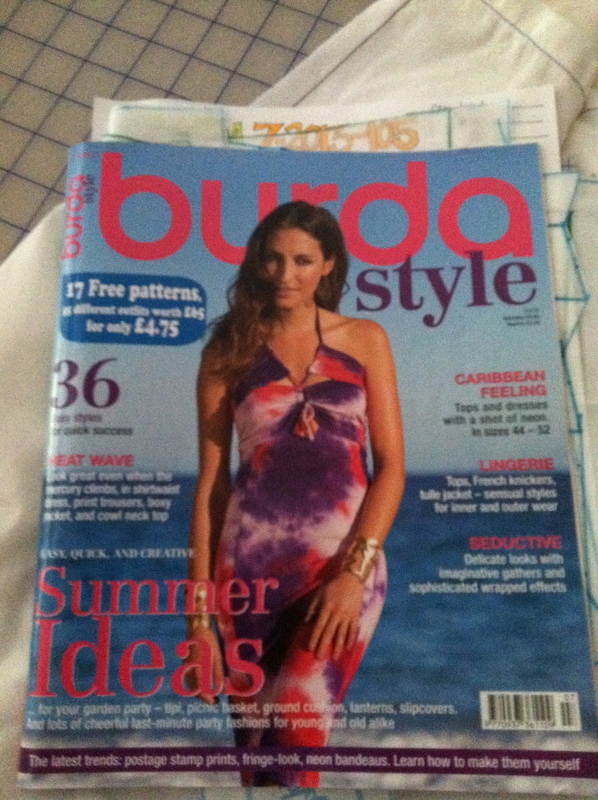 My sewing resolution for 2013 was to sew one garment from each Burda Style Magazine and so far I have. 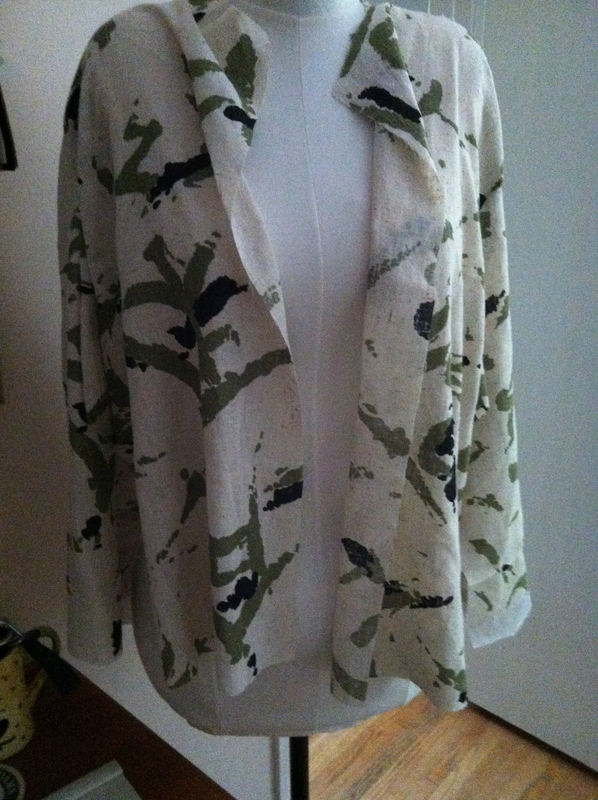 I sewed a muslin for a garment from the July issue and worked out all the fit issues and a few design changes. Now, all I need to do is ‘shop’ in my stash and sew it up. But I have all month to finish this project. What’s the hurry? So, I started on this project, Vogue 1329. 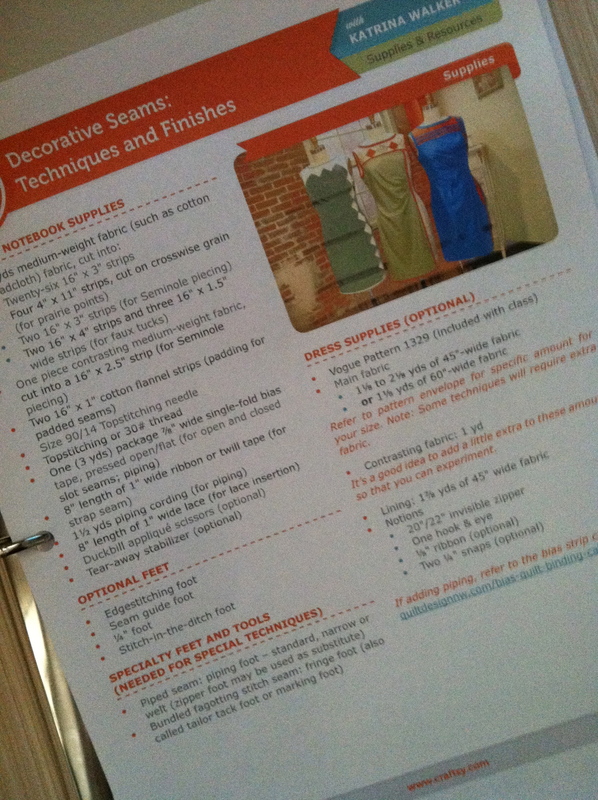 Months ago, I signed up for this Craftsy Class: Decorating Seams Techniques and Finishes. I diligently printed out all the handouts and even made a notebook for them. I was planning on making all the class examples after watching each episode and then taking what I had learned and sewing up the Vogue 1329 dress (which comes with the class). I have to admit that at first glance, I would have passed on this pattern, but I was really inspired after seeing what the instructor, Katrina Walker, did with this pattern. So I sewed the muslin for this dress and altered the fit a bit and that’s as far as I got. I really don’t have anyplace to wear a dress like this, so this project can wait because . . .
After the most recent construction was completed here at the house (we had several windows replaced), I was cleaning up and decided I was tired of having fabric in boxes on the floor, particularly this box of knits. 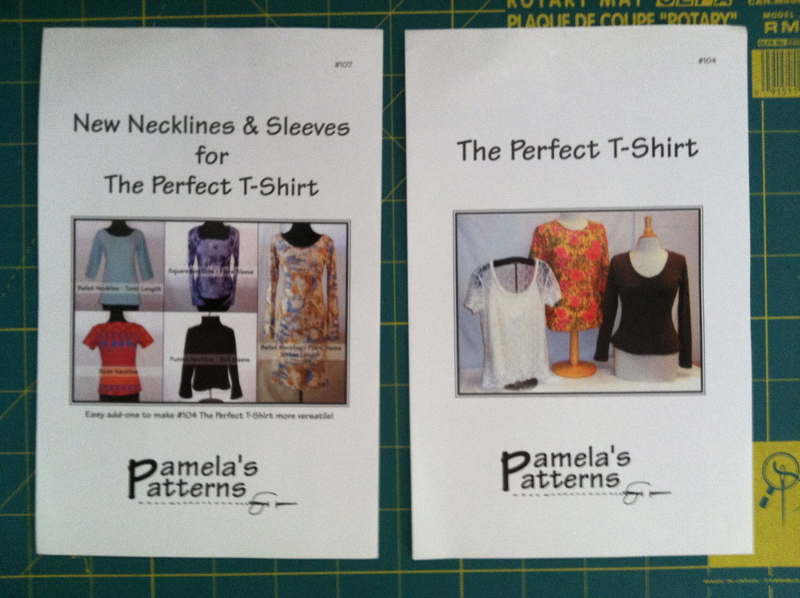 Knits are not my favorite type of fabric to sew – however, I do like wearing knit tops so I thought why not sew up some knit tops to wear for summer. I ‘shopped’ in my pattern drawer and came across this pattern, which I have never used. My first top is almost completed. I did have to make several pattern modifications (like altering the placement of the bust dart) and the next top will have to be a little bit longer – the pattern is a little short for my torso. 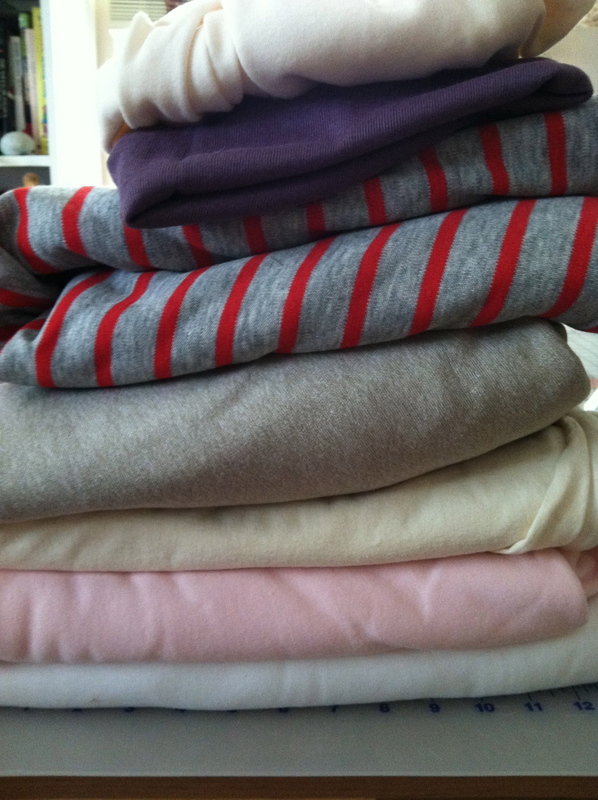 I could sew these tops in a batch – cut everything and then sew everything. That would be efficient but . . . 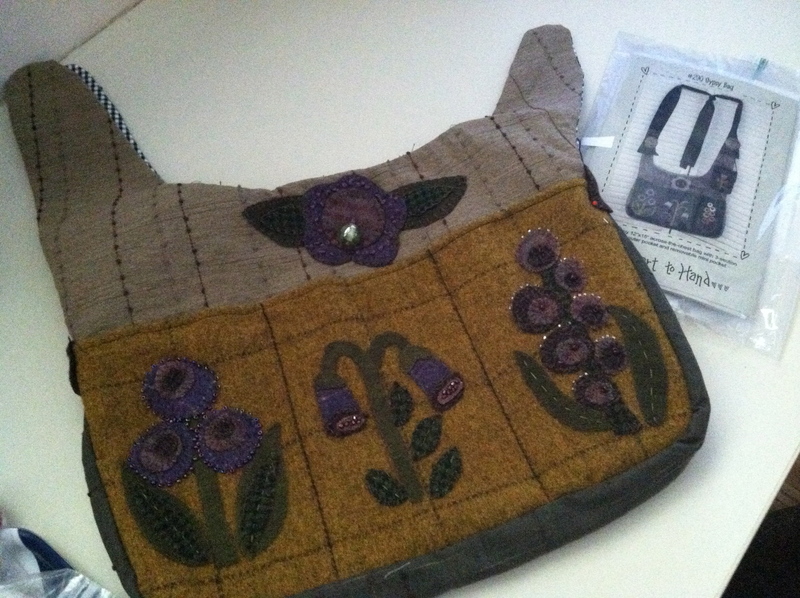 Since I had been cleaning the house and hence, put my sewing machines away, I thought maybe I should do some hand work and finish up this wool purse I started several years ago. 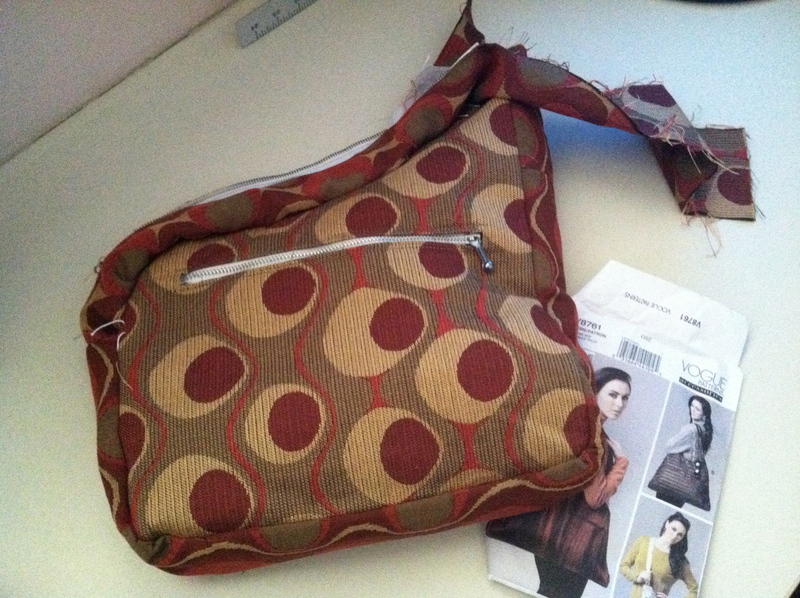 All I need to do is just some finishing work on it and the purse will be done. But it’s summer here and I really don’t want to work with wool right now. I could try and finish up this purse, but I made so many design changes to the pattern I am not sure what I need to do get this purse done. 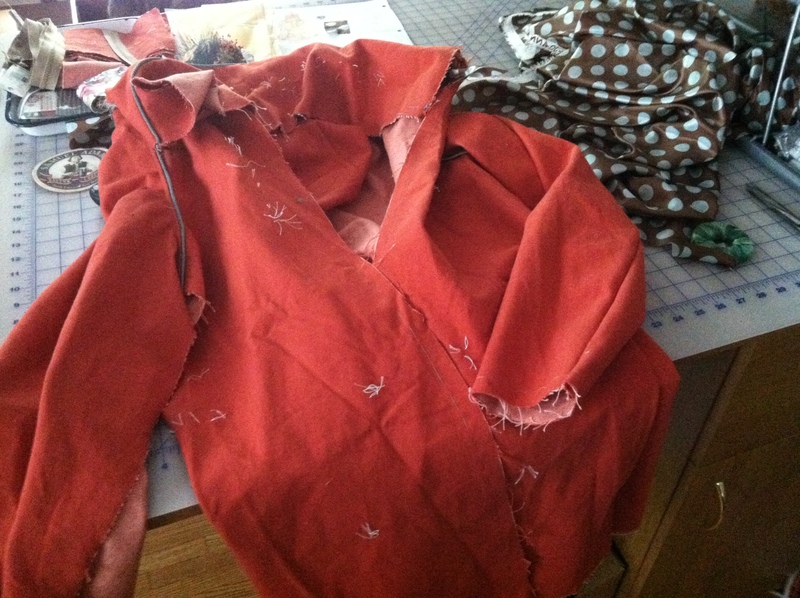 Besides I don’t like the fabric I chose for the lining so I need to make a new lining that I like. 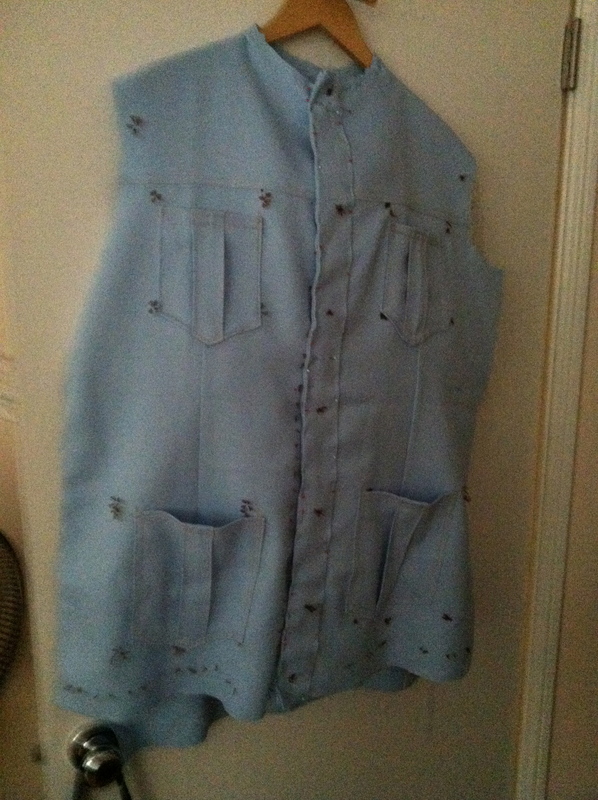 This leisure suit, which I am sewing for my brother, has been hanging on the back of the sewing room door for years. 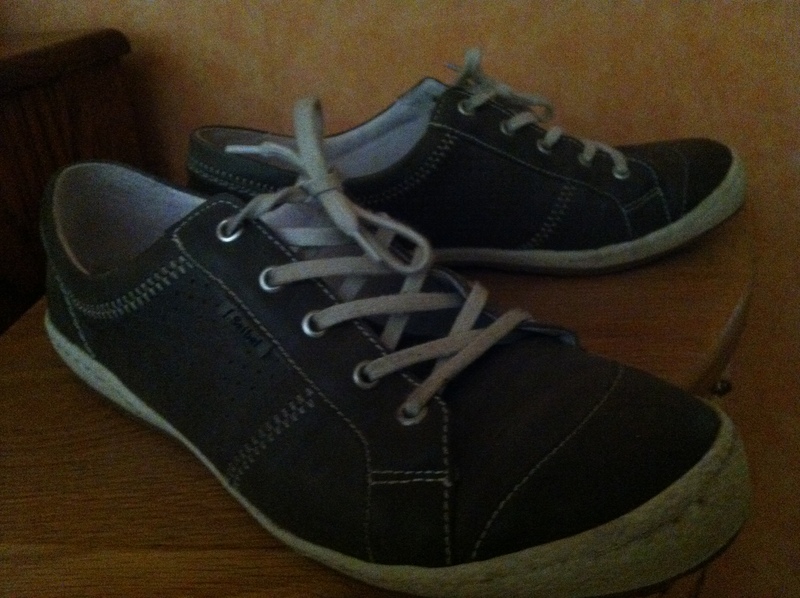 I had it almost completed but than I fitted it in my brother and I had to do a few fit alterations. I then needed to do some seam finishing so I took some of it apart to get that accomplished. I need to fit it again on him, but he is on summer vacation so he’s pretty busy. I should just get it done. It would be nice to be able to hang something else here instead. But, he really doesn’t need this until October – it was suppose to be a Halloween costume wasn’t it? I’ve waited this long what are a few more months. And then there is this project. I did finish the pants -a wadder! And the top is about half finished. It had been on my dress form for several weeks now waiting for me to get back to it. I altered the back and modified the sleeve cuffs, too. I am almost finished with it, but the weather is so nice outside and I should get some work done in the garden so . . . The tomatoes are doing really well this year (unlike last year) maybe because we have had a really intense heat wave. 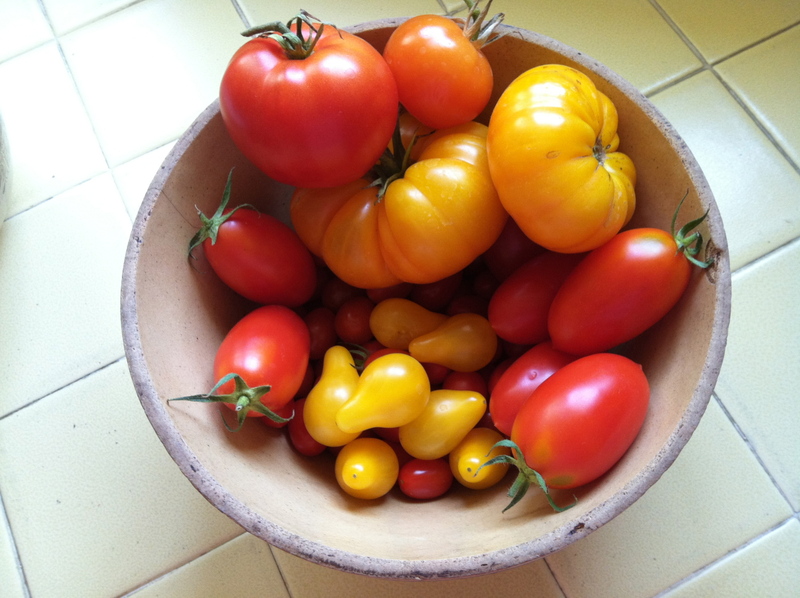 The tomatoes are so tasty and we have so many, too. Maybe I should drop some off at the neighbor’s house down the street. While I am out I should take the dog for his afternoon walk, too. You know, could really use some walking shorts with lots of pockets. Hey! Maybe cargo shorts. 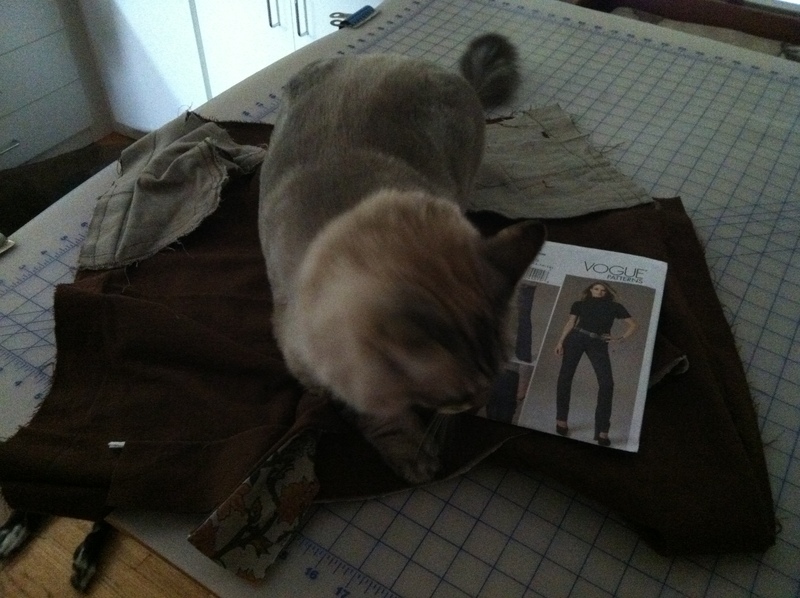 I wonder if I have a pattern . . . .
« No sewing. Just waiting. This is hilarious! It must be my genetic makeup because I MAKE MYSELF FINISH A PROJECT before starting another one. The exception being mundane things like backing a tapestry or a bedskirt because I really don’t care for home dec sewing! And cargo shorts sound wonderful. 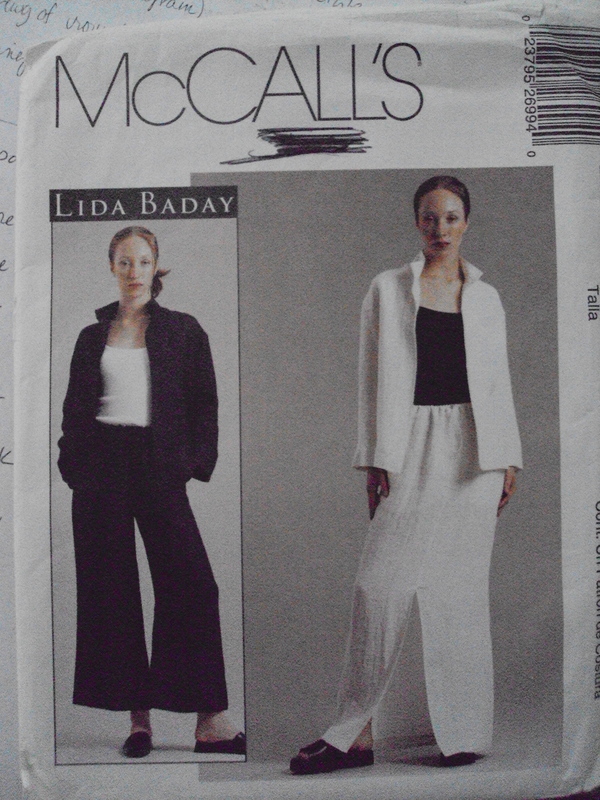 That reminds me, there’s a cargo maxi skirt in a Burda magazine that I’ve been meaning to make for a while…..
See! Now I got you thinking about sewing up another project! I’m bad! Maybe we were separated at birth? LOL! I can unfinish for England too. Lots of PIGS in my sty. Hilarious!! Thanks for this! I don’t sew, but I craft. And I have tons of partially completed projects. Guess I should resolve to complete at least two during January!